This weekend saw the 10th race in my 20 for Pancreatic Cancer UK in 6 Months; a challenge, let me tell you, that I am relishing. The plan was for a TWOFER, 2 races, 2 medals, 1 day. 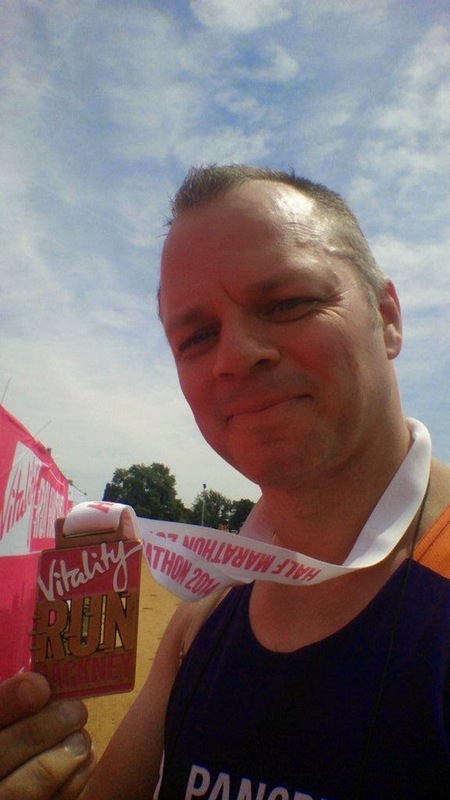 I was going to run the London City Mile at 12:15 after the Hackney half marathon at 9 to tick off two races. The day however was always going to conspire against me. 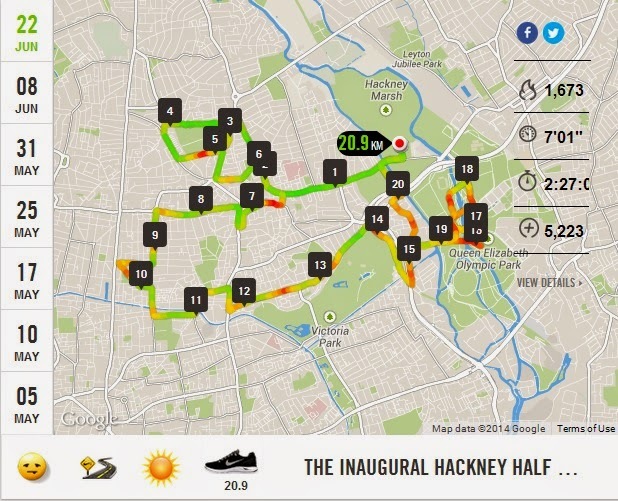 The Hackney Half was an inaugural race, the first running of the east London half with 12,000 racers that would make it London’s premier half to rival the more established Ealing and Royal Parks. It was a hot and sweltering day, and there really were 12,000 of us there, making it a massive race and perhaps we were corralled too closely together as it took nearly a quarter of an hour to cross the start line. And then, with the heat and a pretty flat course, people pushed themselves and took on either too much or too little water at the many water stops, of which there were many. There was also a couple of cool mist showers and toilets. This was all good, or so I thought as I plodded around in a slow time, to save myself for the London City Mile afterwards. Of course, that is where the plan fell down. I crossed the start line 15 mins after the planned 9am start, I added 15 mins extra onto my time because I was taking it easy in the new New Balance 10802Es size 9.5, the perfect combination, at then at the end would have a 20 minute walk to Leyton station to get onto the Central Line to get back to St Pauls by 12:15. Was I a fool? Maybe. Or was I just ambitious? Regardless I didn’t make the second race with Marty Ewers and Sophie Raworth. I did meet a former Pancreatic Cancer UK runner though on the way back to the station and wish I had taken her details about the London Marathon. So, race 10 of 20 done, yet another half, but what do I think of it? The race was ok for an inaugural run. I have run 46 races in just over 2 years now and have run a few first time runs. Surrey was very good. This was ok. But I am more disappointed in a medal that is more about Prudential Vitality than the place. 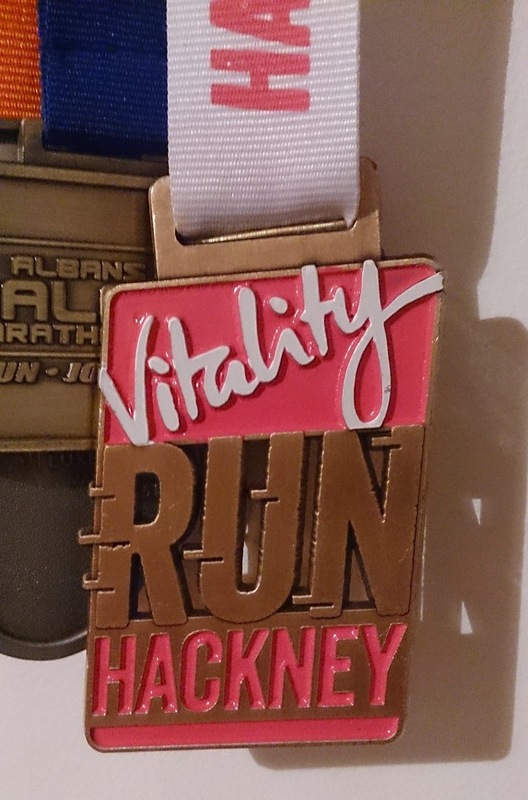 Am sure the other Vitality runs (Reading, Brighton) etc will end up with the same medal, just the placename at the bottom changed. Sadly a lot of people didn’t finish, so I need to put a little more of a positive spin on my 15th race of the year. I have never seen so many fallen fellow runners as I did in the last 3 miles. All in I would guess about 2 dozen people I saw flat out on the ground, and it is very sad. 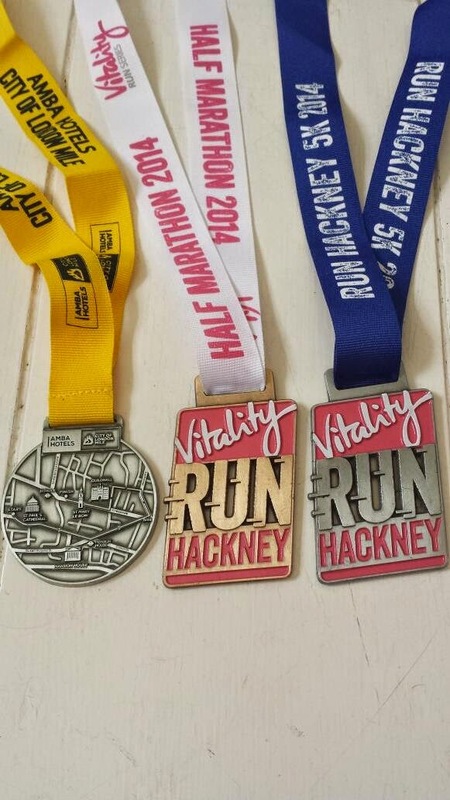 Marty Ewers did manage a triple – the Hackney 5K on the Saturday, the half and the City Mile. The City Mile medal is lovely, well done to Nikki Rees and the guys for organising that. 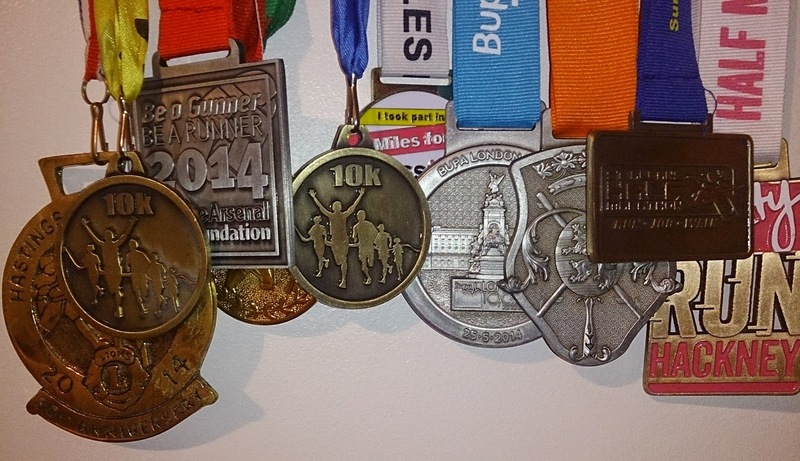 I do wish I had done it instead, as that would look good on the rack along with the 10 Medals for Pancreatic Cancer UK so far. So to Summarise, this was a well organised, well supported run. I was not a fan of the bling. I would not do it again, as it was a 20 min walk after a tube ride to get there. But I would recommend people do it. 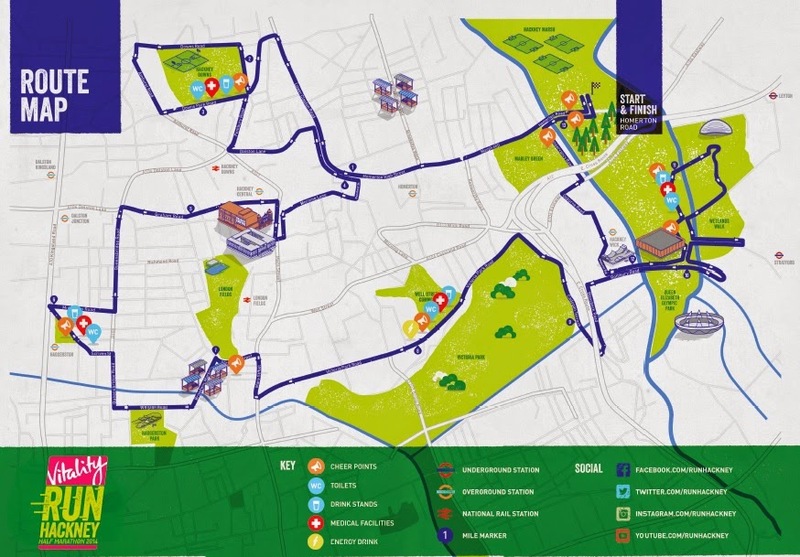 UP NEXT: The Standard Charter City Run and the National Lottery Anniversary Run in mid July.